Video games have been the most dynamic media-based market in entertainment industry, and the growth of the gaming industry in Europe is unabated in 2015. The continuous advancement and innovation in games and gaming console technology in games industry generates an endless stream of new products, platforms and market models. The major revenue of Europe Games Market generated from the sales of gaming consoles. Gaming console acquired the huge proportion of revenue in gaming industry, with major players such as Sony and Microsoft acquiring more than 80% Europe gaming console market. The Europe gaming console market is growing but now the market is facing increased competition from other substitutes such as mobile and cloud gaming. Goldstein Research analyst forecast the Europe gaming console market to expand at a CAGR of 4.3% during the forecast period 2016-2024. Further, the market is anticipated to reach USD 14.3 billion by the end of forecast period. 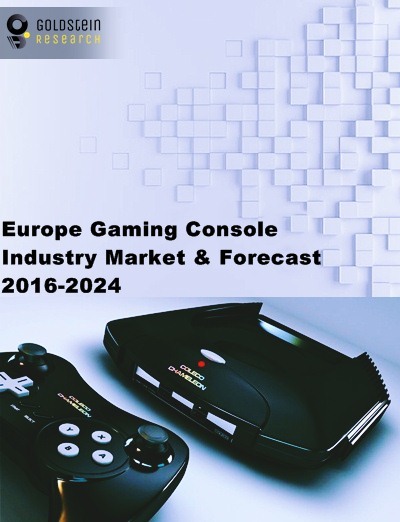 The report covers the present ground scenario and the future growth prospects of the Europe gaming console market for 2016-2024 along with the total revenue of gaming consoles in every region. We calculated the market size and revenue share on the basis of revenue generated per segment and region on a regional, and country level. The revenue forecast is given on the basis of number of gaming console companies and current growth rate of the market. Based on gaming console type T.V gaming consoles accounted for the largest revenue share of 91% in Europe gaming console market in 2016. T.V gaming console segment is the fastest growing segment, likely to expand at a CAGR of 4.3% over the forecast period i.e.2016-2024. Europe Gaming console Market Outlook 2016-2024, has been prepared based on an in-depth market analysis from industry experts. The report covers the competitive landscape and current position of major players in the Europe gaming console market. The report also includes porter’s five force model, SWOT analysis, company profiling, business strategies of market players and their business models. Europe video game console market analysis report also recognizes value chain analysis to understand the cost differentiation to provide competitive advantage to the existing and new entry players. Our Europe gaming console market report comprises of the following companies as the key players in the Europe gaming market: Sony, Microsoft, Nvidia Corp., Valve Corp., PlayJam, BlueStacks, Nintendo Co. Ltd., Mad Catz, OUYA Inc. According to our Europe gaming console report study on the basis of extensive primary and secondary research, one major trend in the market is the advancement in new generation gaming consoles. For instance, Sony PS4 Pro and Microsoft Project Scorpion is gaining huge popularity across the globe owing to their advanced specifications and are expected to boost the gaming console market. According to the report, major driver in Europe gaming console industry is the product innovation and enhanced technological specifications of gaming consoles. In Europe more than 35% population is an active gamer, which highly contribute to the gaming console market. In past few years with the release of PS4 and Xbox One, the Europe game console market share has grown more than ever and is likely to impel the market growth after the release of next generation gaming console in coming years, that are expected to hit the market with advanced gaming features such as 4K graphic technology. Further, the report states that one challenge in Europe gaming console market is the rapid growth of mobile gaming segment from past few years. With the evolution of mobile gaming, people tends to play more games on their smart phones as these devices provide quick and easy access to gaming content. Geographically, Germany accounted for the largest market share with USD 1.4 billion in Europe gaming console market. Germany is closely followed by the U,K and France in terms of revenue share and accounting for more than 70 million console gamers in the region. Russia holds the growth potential in gaming console market due to increasing teenage population.